I've been sneezing and coughing and hibernating for almost two weeks now, but yesterday afternoon I decided it was enough and I needed to shake myself. 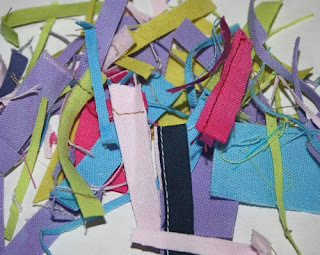 I picked some fabric scraps from my boxes and I quickly sewed a little doll quilt. I am so in love with this sweet colour scheme that I had to take a picture of the tiny leftovers. I have so much hand-dyed fabric left over from my Twelve by Twelve Colorplay projects that I really need to use it. And I like how I'm now using colours that I would never have thought of, like this light green for example. It's not really a new love, as I can't even remember who taught me how to crochet, I guess it was my mom or my grandma. Anyway, I made a small granny square blanket, and it was so much fun that I will do more. Feel better!! Very cute doll blanket. That color scheme could be very healing. Hope you feel better soon Françoise! Love the colours and pattern of the doll quilt! I think Spring is on it's way to you very soon. That should help you to get better..some lovely sunshine. Sometimes doing something a bit mindless or quickly finished is a good cure. Best Wishes, from NZ. You sound as if you've had a really nasty cold, hope you shake it off soon. I love the colours and design on the doll's quilt, what a lovely thing to make. 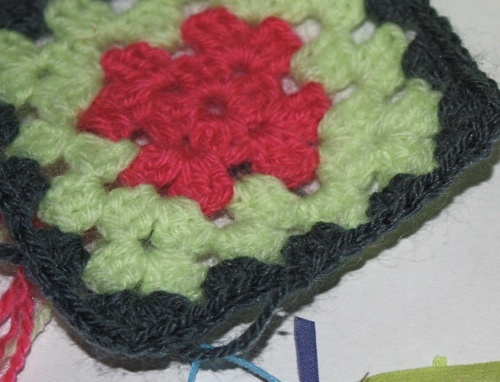 I have awful trouble crocheting, but my daughter loves it, great little patch. Hope you feel better soon, Francoise! 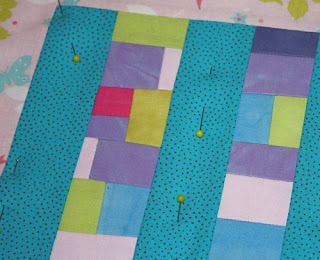 Love the little doll quilt; the colors are fresh and spring-like. Aw, that is a sweet little dolly quilt. And sometimes sitting on the sofa crocheting is best cure for a cold. :-) I'm glad you're feeling better. I hope you feel better soon... I love little square shapes.. so pretty! I hope you are over your cold by now Francoise. 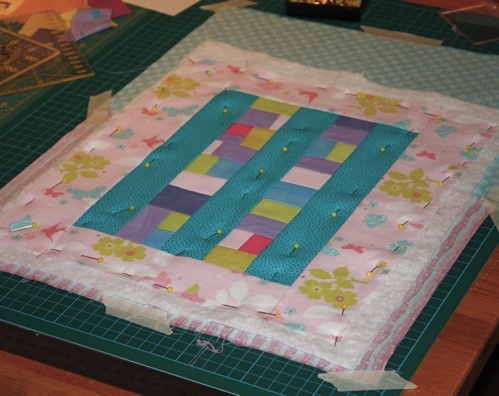 Lovely little quilt - nice to have lots of pieces to use & new colours too.